Dialogue is the word every coalition seeking saboteurs are using to beg for public sympathy. This is after causing serious damage and exchanging the lives of innocent Biafrans for their selfish interests with the Nigerian government but instead of showing signs of repentance by rendering open apologies to the people and taking steps to appease the souls of the innocent Youth that died in Umuahia and all over Biafra land during operation Python dance II, they now run from pillar to post begging for coalition. Ohaneze Ndigbo is going through the back door to search for an opportunity to be welcomed as a body rubbing shoulders with the great IPOB family. IPOB cannot be deceived by their false pretence. The simple biblical saying that “By their fruit we shall know them” must be the lens to guide every Biafran when such issues are discussed. The fact that notable individuals have suffered so much persecution in the hands of the Nigerian government because they are from Biafra land is clear to everybody. Biafrans know the likes of Innocent Chukwuma (Innoson), Senator Enyinnaya Abaribe and other politicians in the Nigerian government who are facing persecution day and night just because of their place of origin. But the idea of coalition and quest for dialogue sound shameful and questionable especially when those who are championing these events are not strangers in the land. The people know them and the people are mindful of their contributions positively or negatively to Biafra. Why are they afraid of joining IPOB family from their locations and make their contribution to the people directly? There is only one channel to join IPOB and every member of the Indigenous People of Biafra know this, that if you have any contribution to make for the people, it is very simple and open, join the nearest IPOB family near your house like every other Biafran anywhere in the world and you have equal right like every other Biafran anywhere in the world. In IPOB, Power does not belong to the government, Power belongs to the people that is why IPOB is doing everything in the open. Ohaneze is a secret agent whose activities the Igbo people do not clearly understand while IPOB is running an open door policy where everything is done in the open. Some people are just being myopic and sentimental about simple issues. The subject of dialogue has been used severally by those who fail to understand the real essence for dialogue. Ohaneze Ndigbo was formed immediately after the civil war and they have been there all these while romancing themselves with the Nigerian government while the social injustice against Ndigbo reached the lower parts of hell. The cultural identity diminished and even the Igbo language is fast disappearing at the lips of Igbo elites. 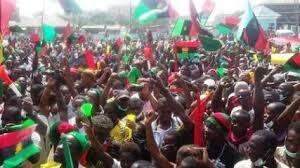 While IPOB has in totality rejected the romance with the Nigerian government and declared total freedom by asking every genuine Biafran to join the fight for total emancipation. Biafrans tested and validated the fact that IPOB truly represent the interest of the people and everybody followed Mazi Nnamdi Kanu. IPOB have continued to create the awakening that is sweeping through the whole universe and restoring the lost identity of Biafra. The 30th May simply reminded the world how the people have followed all along. What really, is the essence of dialogue when Nnia Nwodo refused to abandon restructuring Nigeria against the interest of everybody including his Fulani masters. Mazi Nnamdi Kanu warned Nnia Nwodo that the Hausa Fulani will never accept restructuring but Nnia Nwodo insisted in begging for it. After the whole saga and the open rejection of restructuring to the point that it was voted out in the House, Ohaneze still want restructuring and want IPOB to throw away Biafra referendum. The question is should IPOB wast her time giving attention to such dialogue? What else is what the subject for dialogue? Ohaneze has exhausted the essence for dialogue. If there is no influence of a third party who is mounting pressure on Ohaneze to quench the burning desire of the people who simply ask for their fundamental human right why is Ohaneze not promoting the interest of IPOB or at least respect the fact that the cultural Identity of the People have been destroyed and IPOB is simply fighting to restore it. So why should Ohaneze struggle with the simple truth? It is clear that the group known as Ohaneze Ndigbo failed to convince Ndigbo and Biafrans at large that they are not agents of the Hausa Fulani who parade themselves as Igbo leaders and use their platform to infiltrate and destroy every genuine group that is fighting for the common interest of the people. Anybody talking about dialogue or coalition is an agent of distraction. IPOB are focused on one purpose and it is Biafra or nothing. Let us have all the dialogue in the ballot box of Biafran referendum.